Far, far away in a place called Hawaiki a boy named Mãui-Tikitiki, youngest son of Taranga was born. Born prematurely, his mother thought he was dead and cast him into the sea. Washed ashore by rippling waves, tangled in crusty seaweed and swarmed by gulls and fleas, his ancestor Rangi, the sky father, reached down, drew him up and nursed him back to life. Years later he suddenly appeared among his elder brothers one night as they stood in the haka line at their home. Like his brothers, he was tall, copper-bronzed with wavy hair, chocolate coloured eyes and massive limbs. Mãui became known as an intrepid troublemaker, his female relatives had little regard for him as a producer of food. With no daring adventure to engage him, he idly hanged around listening to the women gossiping and muttering, ¨The man who loafs in the sun, beat his head. The man who produces food, love him well¨. Finally stirred Mãui hollered, ¨Listen you women, you know I´ve achieved everything I sought to do. Do you think that this business of procuring food is beyond me? Presently you will see food lying here in the sun¨. So, when next he heard his brothers say, ¨Let us go and fish¨, he climbed aboard. But his brothers roared, ¨You can´t come with us, you´ll only make trouble¨, and they left without him. That night he climbed aboard and hid beneath the decking of the canoe. Once at sea his brothers discovered him. Irritated, they turned around to row back to shore. However, instead of the shoreline coming closer the distance seemed to get further and further away. ¨Can´t I stay, just to bail the canoe¨, cajoled Mãui. Understanding that Mãui was using his magic powers, his brothers finally capitulated and paddled further into the ocean. Arriving at their fishing ground Mãui proclaimed, ¨The fish here are worthless. Let us go right into the open sea and anchor there. If you go to the place I choose your hooks will not reach the bottom before being seized by fish and we´ll be ready in a wink of an eye to return home¨. Agreeing the brothers continued to paddle till the mountain ridges had sunk below the horizon. The hooks of the older brother had hardly touched the water before being seized. Before long their canoe was full of fish and they prepared to return. ¨Wait a bit and let me cast my line!¨Mãui cried. ¨Where´s your hook?¨ catching their breath they looked on with wonder as Mãui produced his hook. The hook was fashioned in the form of a lure-hook, carved richly, inlaid with paua shell and tasselled with white hair from a dog´s tail. ¨Give me some bait¨, but his brothers refused, so Mãui doubled his fist and smote himself on the nose. With blood on the hook he cast it down, deep into the sea. Mãui pulled and heaved on the line with the sea boiling around them. ¨He has brought us out here to be capsized and fed to the monsters of the sea¨, shrieked his brothers, but Mãui continued to draw on his line until his catch, a land-fish lay exposed to the sun, and their canoe sat high and dry. ¨Now, listen to me¨, Mãui asserted, ¨I must go to the priest and make an offering to the god for the good fortune that is ours. Be patient until I return. Do not cut up our fish and do not eat until the God has been propitiated and I´ve returned. When I do we will divide our catch, and each will take his share¨. However, once Mãui left, his brothers started arguing about the possession of this new catch. Frustrated that they couldn’t agree, they picked up their weapons and began to chop at the fish. The God displeased made the fish toss and thrash about on the water as they hacked. 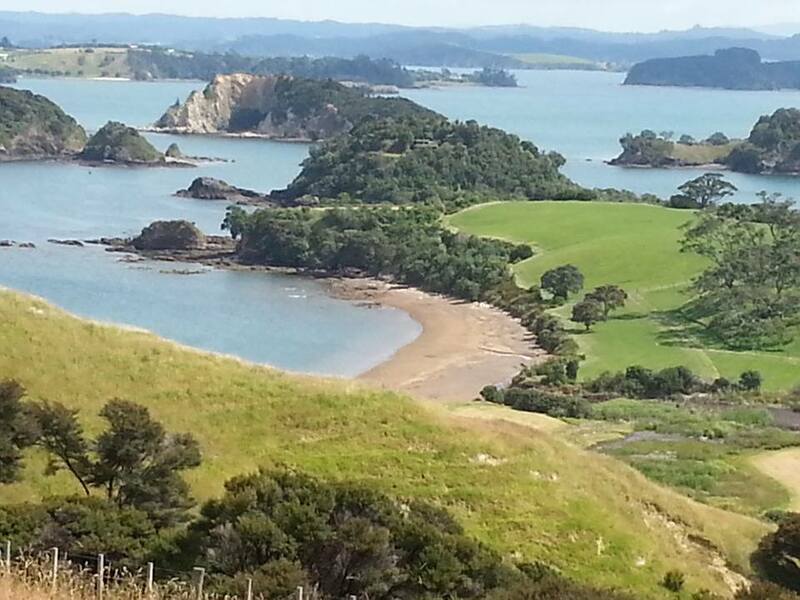 These blows resulted in ​​the many mountains and valleys of the North Island as you see it today. 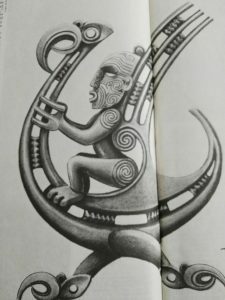 Today Maoris know the North Island as ‘Te Ika-a-Maui ” official Maori name (the fish of Maui), while the South Island is seen as his canoe ‘Te Waka-A-Maui ” (the boat of Maui), together with its anchor, Stewart Island ‘Te Puka o waka a Maui ” (the anchor stone of the canoe of Maui). 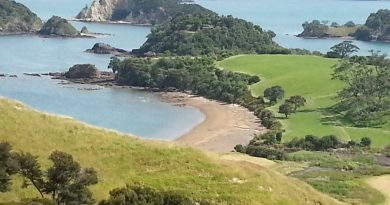 The Mahia Peninsula is Mãui´s hook ¨te matau a Maui¨, the Wellington area is the head of the fish ¨te upoko o te ika¨, the North Auckland peninsula is its tail ¨te hiku o te ika¨. The Maori where able to envisage the shape of the North Island before even maps existed. A glance at a map will confirm it is appropriately named. There lies the ray-like fish, foul-hooked by one fin, its head and open mouth to the south, its long tail stretching far to the north. 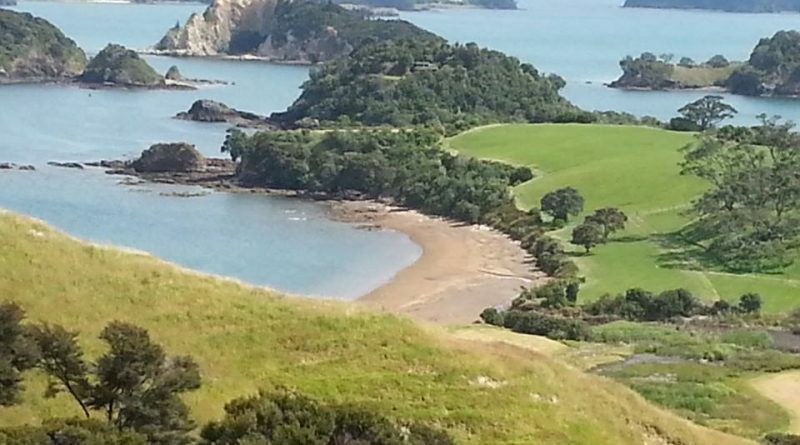 In October 2013, the South Island’s Maori official name became ‘Te Waipounamu’ (meaning the place of green stone). These names are based on the legend but during the years various names have been used for the islands. They have now official Maori names except Steward Island which has no official Maori name yet.